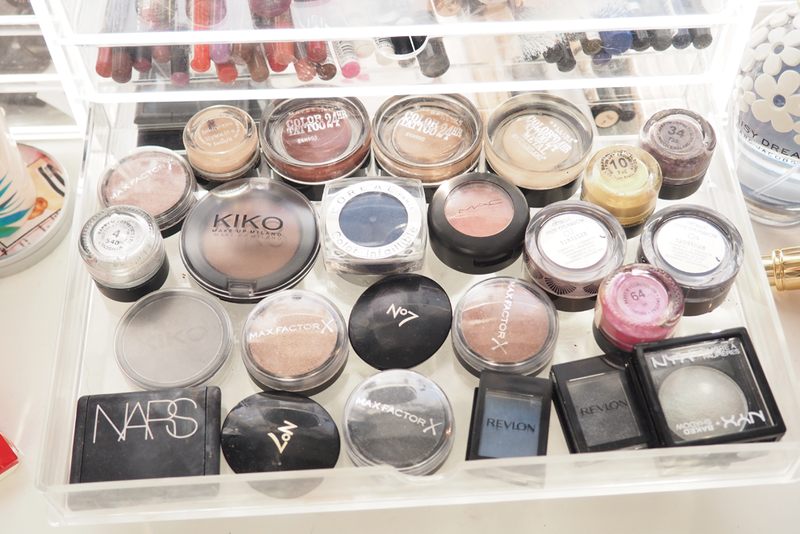 I recently wrote about my affordable makeup storage and since it went down pretty well, I thought I may as well show you what is in some of the drawers. 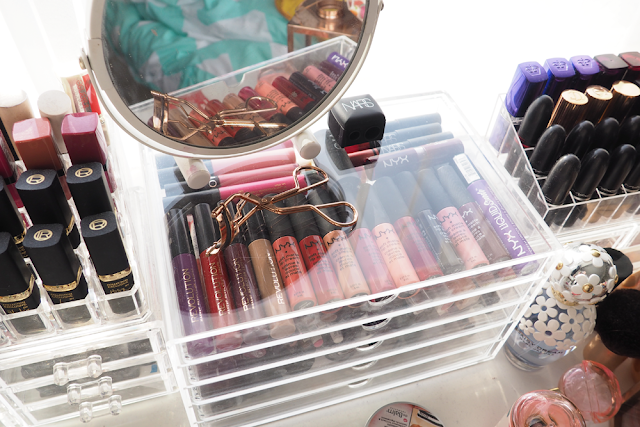 The 5 drawer Muji acrylic storage is situated between two cheaper storage boxes which are full of random makeup items whilst my Muji is all neat and tidy. I love that the top of the Muji storage is flat so you can see what's in the top drawer but it's the perfect height to have my mirror on and some other daily items I use. 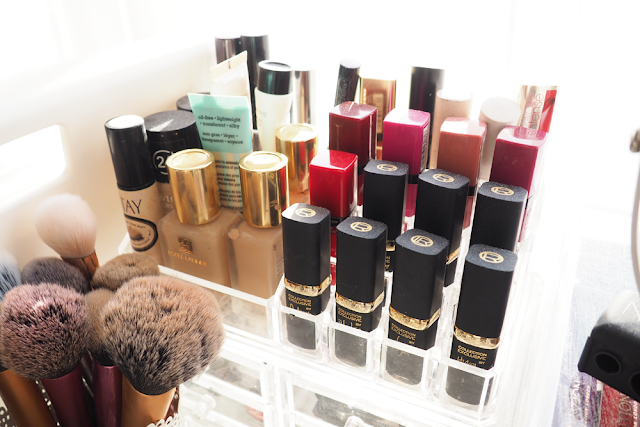 I love having my makeup on display, especially because my lip products seem to be my most loved beauty products. 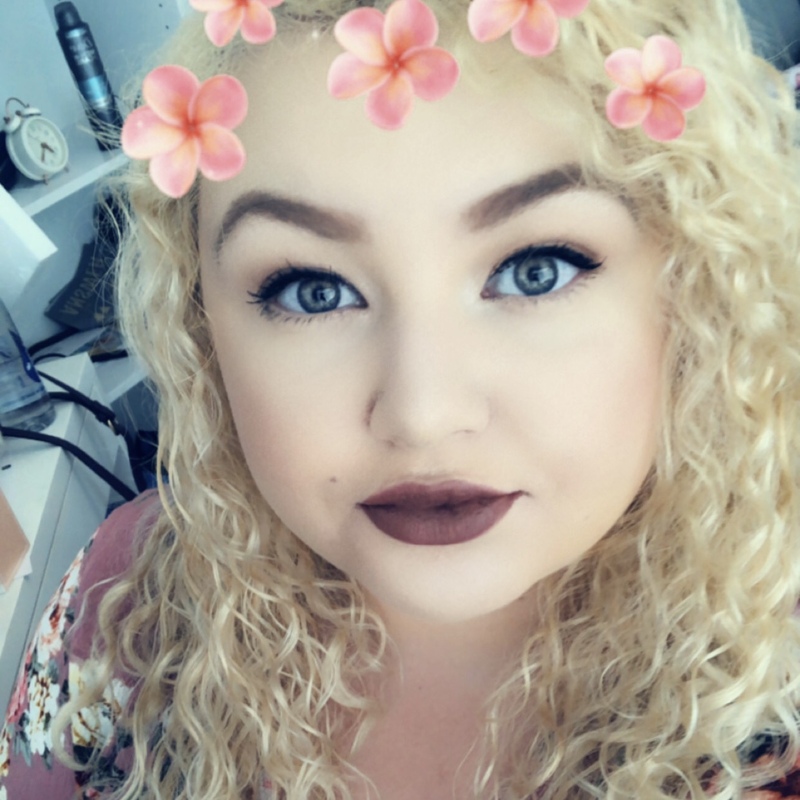 I'm currently trying to use a different lipstick every day to use the ones that aren't as loved, especially some Nyx and Mac shades that are near enough new. 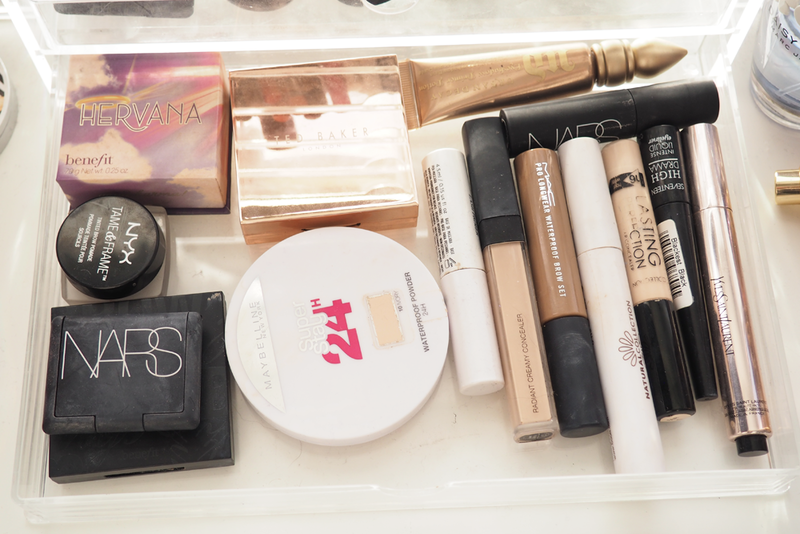 On the left storage box I have my foundations including three shades of Double Wear, my primers, and mascaras. 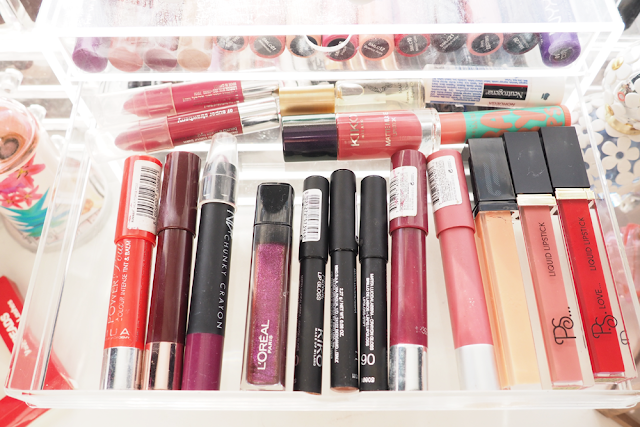 Next to those are my L'Oreal lipsticks and a few Bourjois matte liquid lipsticks. Behind them are lipsticks that have been demoted to the back, such as ones from Topshop, Rimmel and Maxfactor since I don't use them very often. On the right storage box are my very much loved Mac lipsticks, and some others from Charlotte Tilbury, Nars, YSL, Rimmel, Kiko and Maybelline. To the side I have 'things that don't fit in any storage' because the rest of it is full, such as my Make Up For Ever setting powder which is perfect for seamless makeup, a L'Oreal True Match foundation, two Barry M face/body glitters, my Nars Hot Sand Illuminator, and a Revlon lipstick in Black Cherry. The top drawer in my Muji is for liquid lipsticks since they can't be stood up. 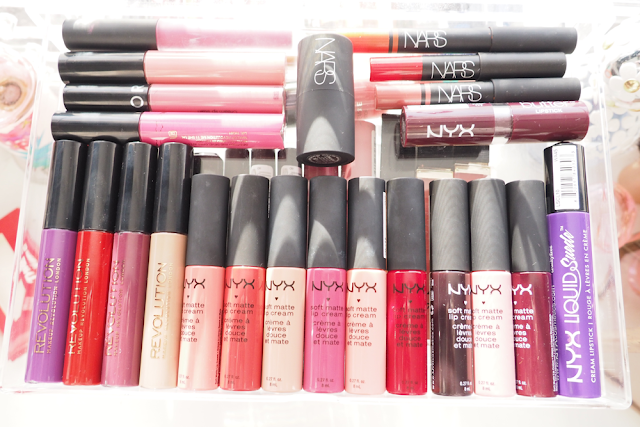 I have all of my Nyx cream matte lip creams and one lip suede (which is just as good), some Makeup Revolution laquers, one from MUA (which is not worth it but the colour is nice) and one from Sephora. I also have a Nyx butter lipstick, three Nars chunky lip pencils and a mini Nars cheek and lip tint from my November Nars Glossybox. 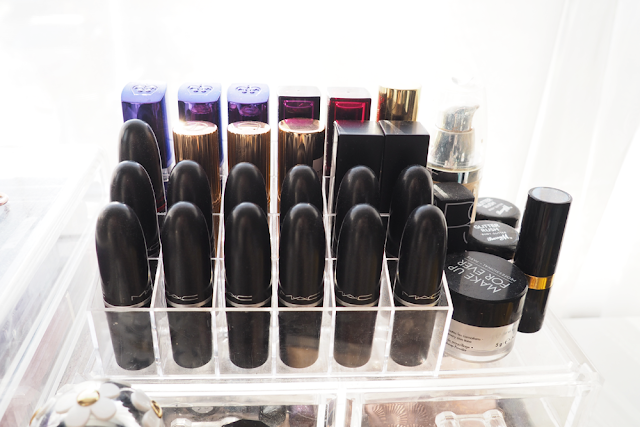 The second drawer contains some chubby sticks, lip glosses and a few liquid lipsticks that can't fit in the top drawer. I have a L'Oreal lip gloss here which is supposed to have the pink version next to it but must be in my bag, which are honestly the best lip glosses I've ever came across. I also have a HD Brows lipgloss which is more sticky but has a lovely colour. The three Kiko lip pencils are supposed to be the pencil alternative to a lip gloss but they're similar to cremesheen and satin lipsticks. I don't think there is much difference in quality between chubby sticks and I have them from Clinique, NV, MUA, Ted Baker and Revlon. Finally I have a lipcote I've never used and two lip balms to keep my lips moisturised. I have a love-hate relationship with my pencil drawer. This is part of the reason I'm looking at buying a second Muji box so I can have two separate drawers for lip liners and eyeliners. 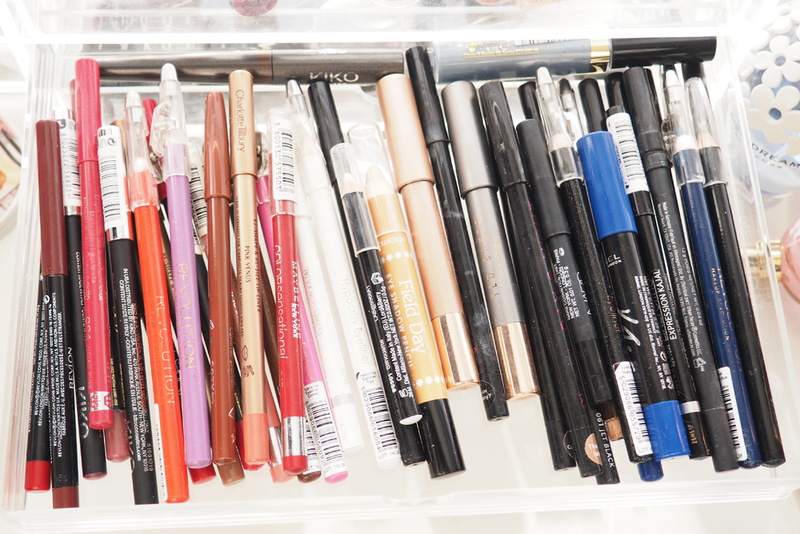 Anyway, to the left I have lip pencils from Revlon, Makeup Revolution, Charlotte Tilbury, Kiko, Maybelline and Rimmel. I then have three white liners which I use for both lips and eyes (not the same pencils obviously) which act is a little border! My eyeliners are from Nars, Makeup Revolution, Rimmel, Collection, Maybelline and a few random brands. My eyeshadow drawer is probably one of my favourites. I never used to be a fan of individual eyeshadows as most of my palettes contain all the shades I need. I rekindled my love for Maybelline Color Tattoos and it grew from there. I've also fallen in love with the good old Barry M Dazzle Dusts as the glittery shades are perfect for intense eye looks without the cost. The blue L'Oreal eyeshadow is one of the most pigmented shadows I've came across and I'm annoyed at myself for not picking more up. Slightly disappointed with the bottom left Nyx shadow as it doesn't have much pigmentation at all. inally, in my bottom drawer I have some face products I use most days. Underneath my Nars blusher I have Benefit's Brow Zings which is amazing paired with Nyx Tame & Frame pomade. I have a big Benefit blusher palette and luckily Hervana was the only one not in it, as this was purchased before the palette. I used Maybelline powder daily which adds just a touch of colour. The rest of the drawer contains mascaras, brow gels, concealers, primers and eyeliners which don't seem to have much of a place, but they're the ones I use a few days a week. If I did buy more Muji storage I'd definitely give all of these a drawer of their own.